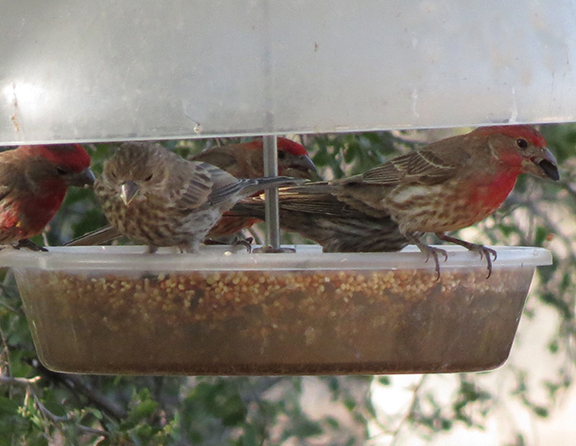 Five finches find food at the fully filled feeder. 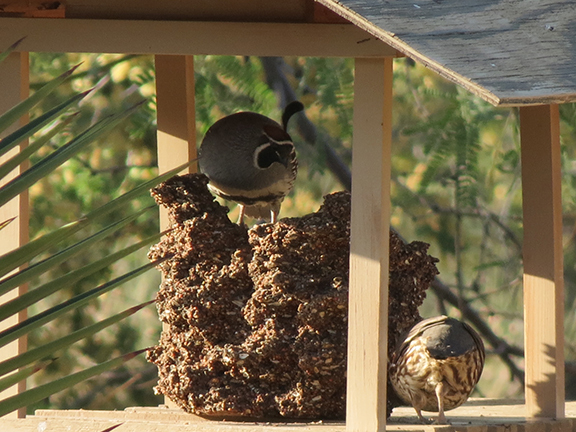 A quail couple chow down on the ‘Peckasso’ block seeder. 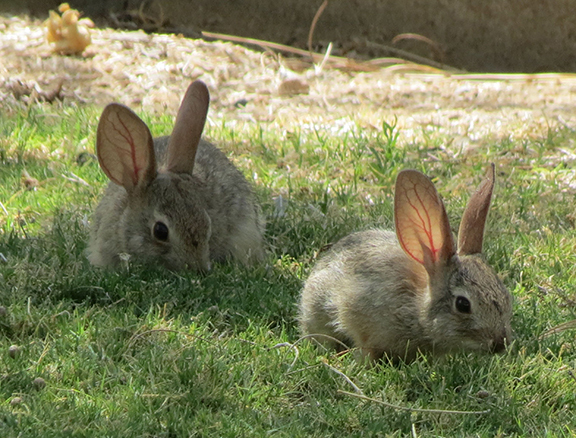 Baby buns have fun nibbling in the cool grassy place. 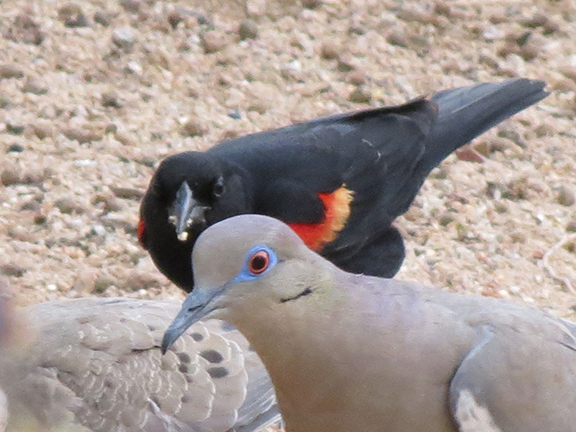 A red winged black bird gets photo-bombed while stuffing his face! 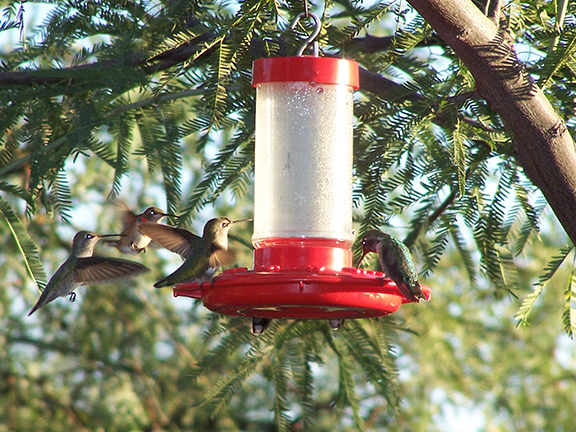 Hummingbirds flirt and hover around their honey hole hangout. 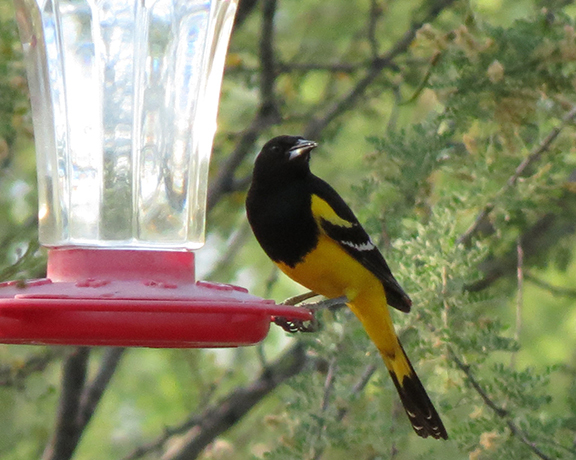 This Baltimore oriel takes a sip stop on his way-back-home Northern route. 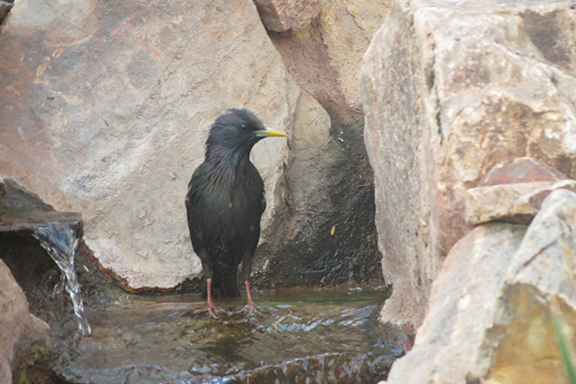 This starling likes to take a sip and a dip. The bunny takes a drink to put the hop in his hip! 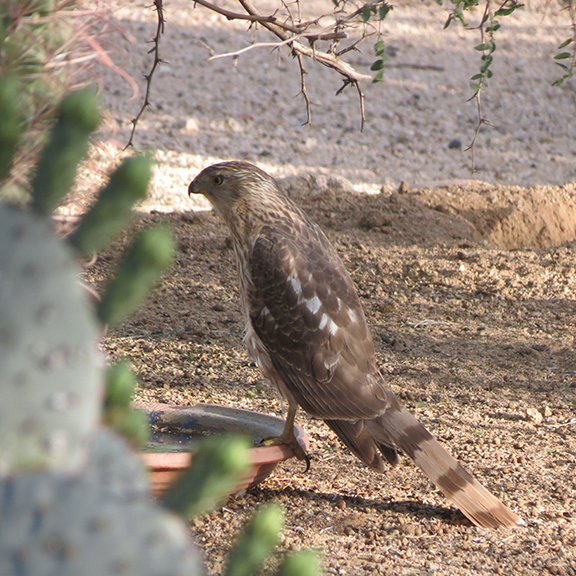 The hawk takes a water break and claims his domain. 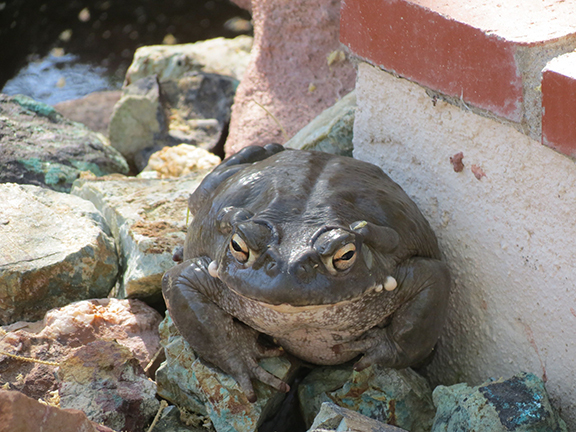 Mr . Toad took a sip and a dip now just waits for the rain. 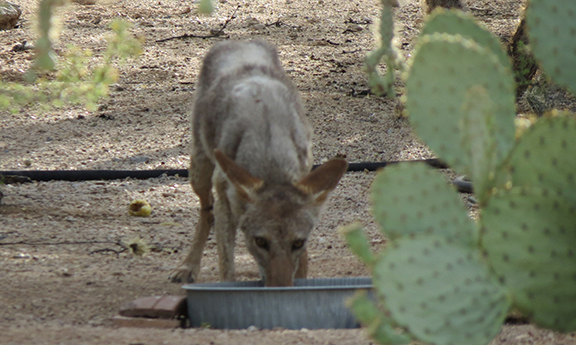 The coyote gets a cool drink, soothing and calm. The javelina , you would think, might want some water to swallow. But, they would rather tip over their drink and make a nice mud wallow! Eat, drink and be merry, then what do we do? 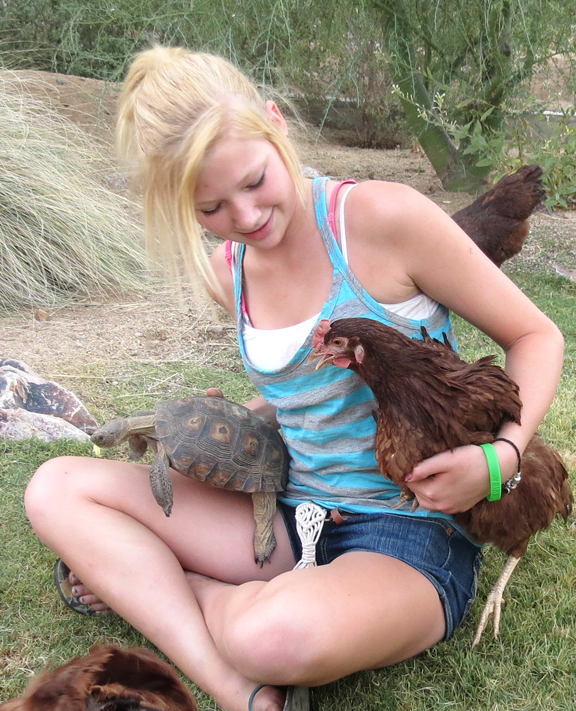 There’s a cool new Summer night spot in Todd’s Backyard!…The party starts at 6pm, nightly at Gerti’s ‘Goody’ Garden, where Gerti (our desert tortoise) host’s a nightly event… the Chick Party! Girls only!!! 3 hot chicks, one hot dog and one ha ha hot mama 😉 With the daily temps of over 100 degrees for about the past 2-3 weeks, everyone is looking for a little cool down…which we’ve found at sundown when the shadows start to cool the yard and the sprinklers shut off on the grass. 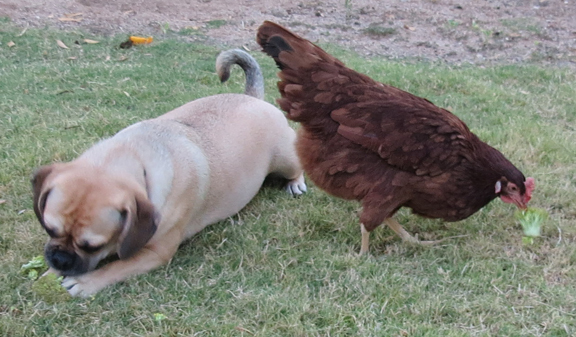 Daizy (the puggle) and I round-up the chicks and head off to Gertie’s! There, the smaller guests enjoy a nice veggie salad while lounging in the wet grass. I enjoy a nice glass of wine, while putting my bare feet in the wet grass…ahhhhhh. 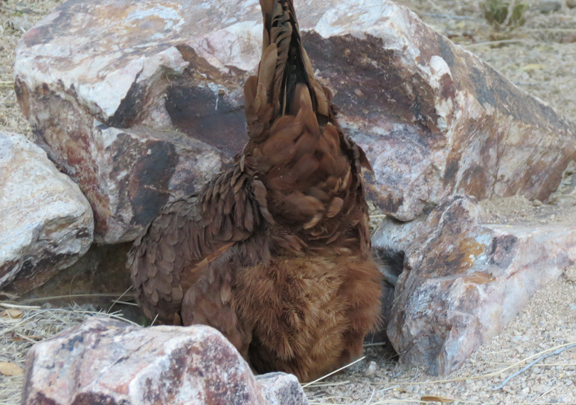 But, things can get pretty wild when the chicks finish their snack. This is when the fun and games begin! 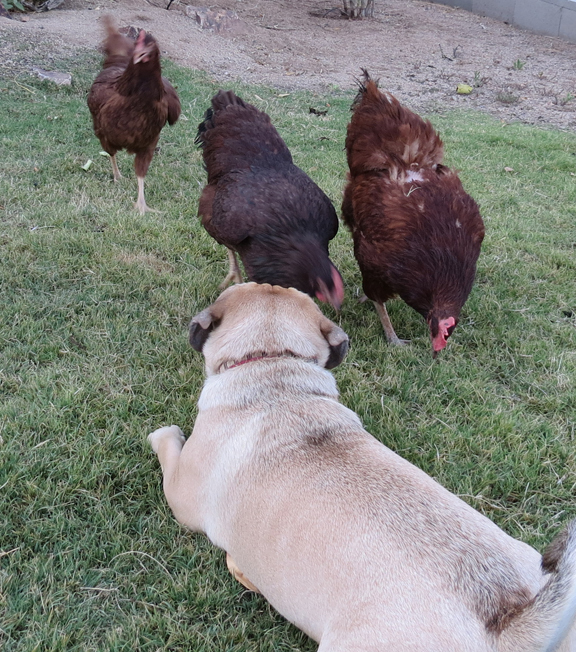 Daizy never actually eats her snack, she just likes to claim it, nibble on it a bit, then wait for her feathered friends to come after it….a great game! And quite entertaining to watch the chicks, relentlessly chasing Daizy around until she gives it up, which in the end, she always does! And time to rock out! You may be asking, “where’s Gerti?” while all of this parting is going on? Gerti is pretty much a ‘legs-off’ hostess. She’d much rather hang out on the sidelines than get involved in the friendly frolicking! And she really does NOT enjoy the pecks on the cheek! But she will do a little mingling when there’s a special guest! Gerti stuck her neck out to join the party when my niece Megan was here! 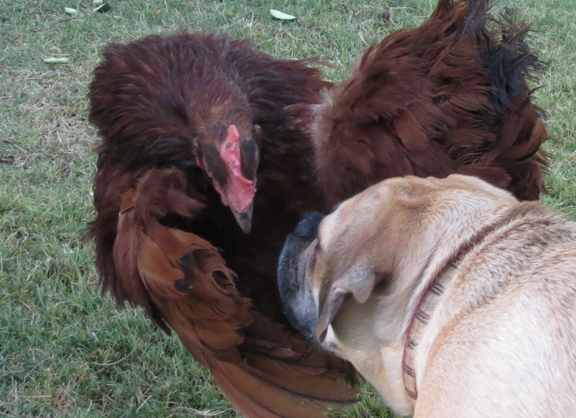 Gerti adored her and the chicks thought Megan was pretty cool too! Well, December 21st came and went. The Mayan calendar ended, the planets aligned, 2012 is coming to a close and life is going on without any major events…Except some nice stormy and wintery weather for the Holidays! For the most part, its been a good year. 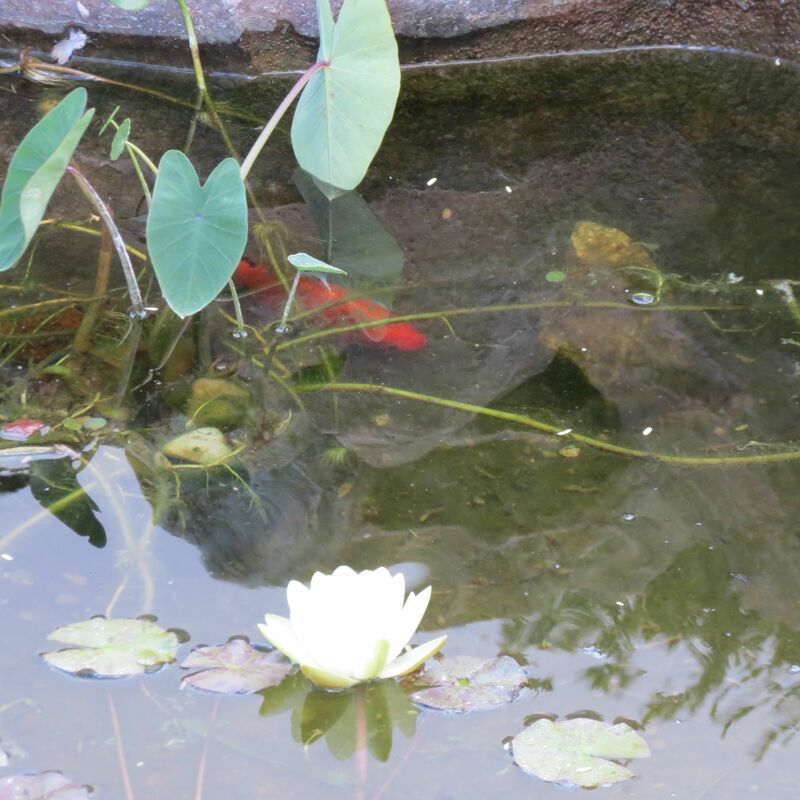 Todd’s projects have yielded a lot more landscaping, a beautiful revamped pond complete with fish, an outdoor potting/work bench, a chicken coop with chicken and a large garden plot ready for planting this spring! 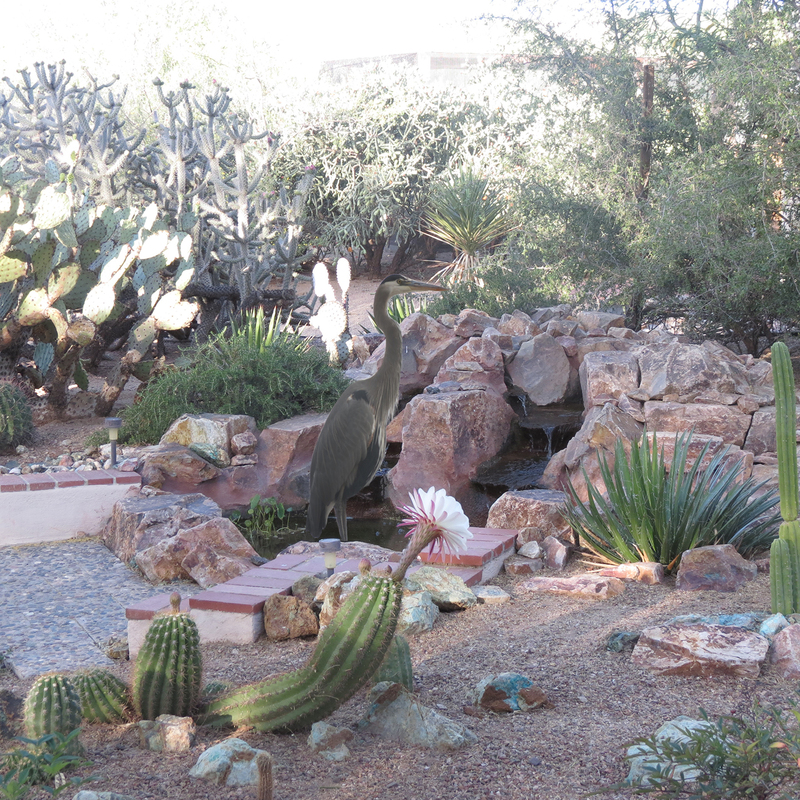 Our little desert acre is a mental sanctuary that keeps us from dwelling on the pressure and stress of ‘real life’! We have been so blessed! 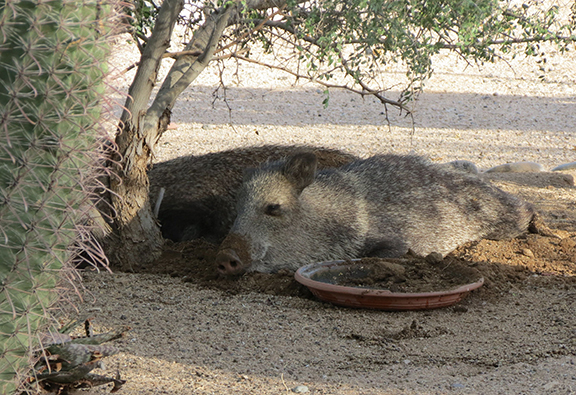 The javelina are thick and having lots of babies! 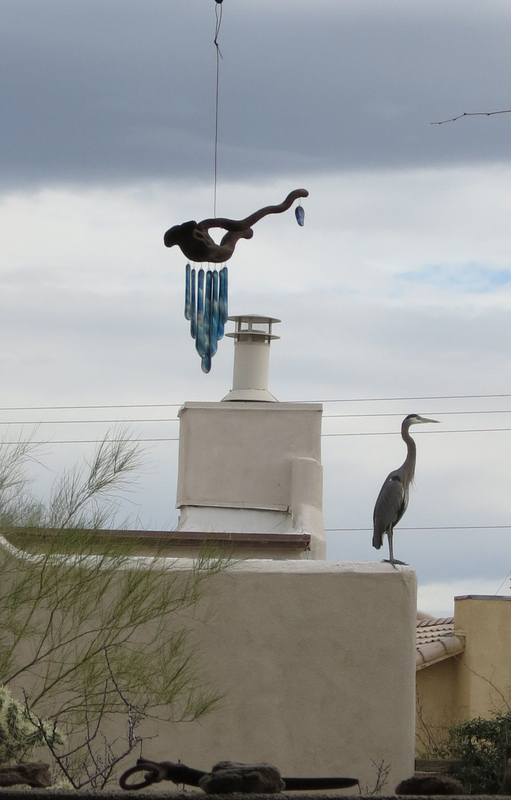 Bob has been hanging out a lot! 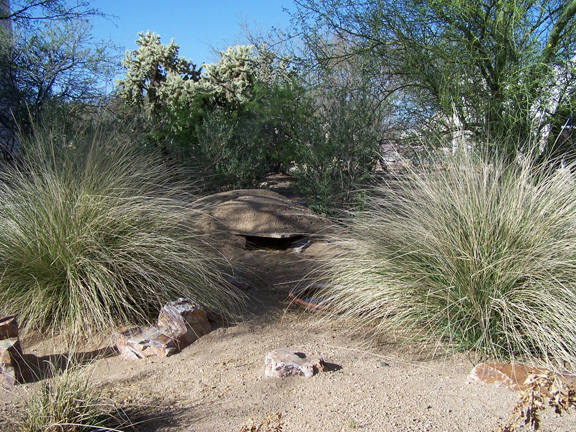 Although, we have not seen the bobcat get a baby javelina, we have seen him get rabbits! Quite gruesome! I think the coyotes are more interested in the baby javies than the bobcats! 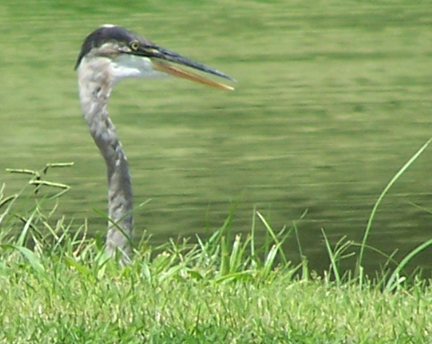 (This next year I hope to get a photo of a coyote..the only pic that I don’t have!) 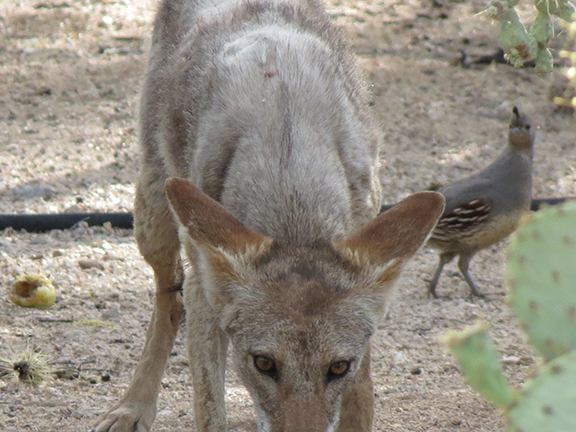 We rarely see coyotes during the day, but almost always hear them at night, yipping and yelping! 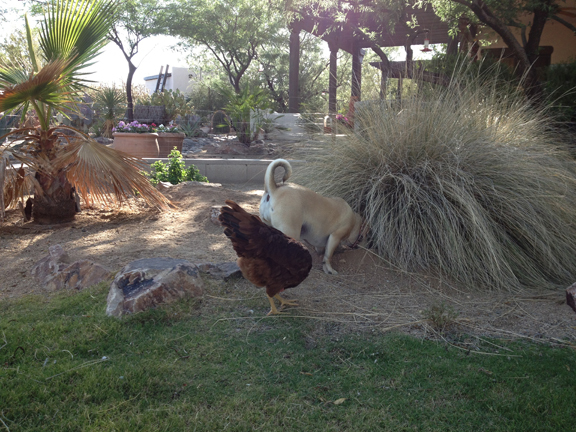 The other night Todd ran outside because we thought they might be trying to get into the chicken coop! 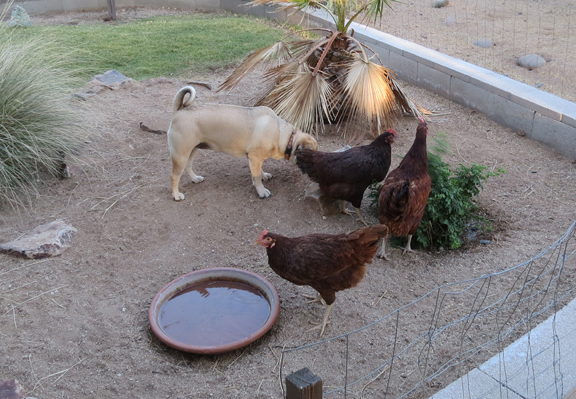 Since then, Todd has put lots of reinforcements on the coop to prevent that from ever happening! I think the coyotes and bobcats have been a major contributor to the dwindling rabbit population! Now, we are lucky to see just one or two bunnies at a time! Awww…One bun’s just no fun! So we decided to get a couple of our own! They are living happily inside, and hopefully, we might train them to be good house rabbits (i.e. to use a litter box). We got a big portable pen to put on the porch so they can go out and run around a bit. It’s a riot watching them running and hopping around! They are little hip hoppers! We can’t leave them unsupervised for a moment though. Or perhaps just a plain hot dog! But Daisy had better watch out! 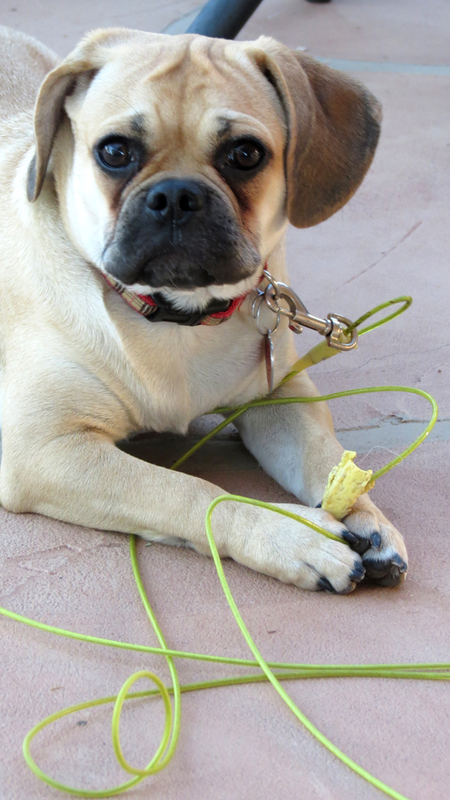 Plump puggle would be a lovely dinner for Coyotes! 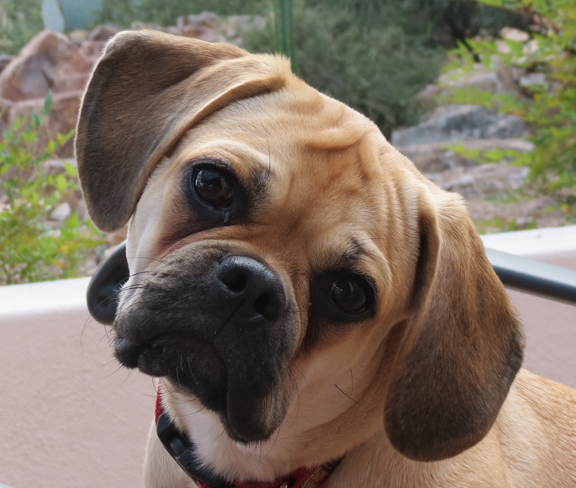 One month ago, we welcomed a new member to our family….Daizy….A puggle! Todd and I have had several very special dogs we have shared our lives with over the past 20 years. All were spaniels (except Lulu, our chihuahua) and have inherent traits that we have grown accustomed to. Daizy, being a mixture of pug and beagle, is definitely a VERY different breed! In, fact, I’m not sure she’s even a dog! A master manipulator, a crazy comedian, a stubborn brat, a 4 legged ball of non-stop energy…just a few things that could describe her. She keeps us screaming and laughing at the same time! Unlike all of our other 4 legged kids, we’ve had to keep her ‘on-line’ when we are on the porch. 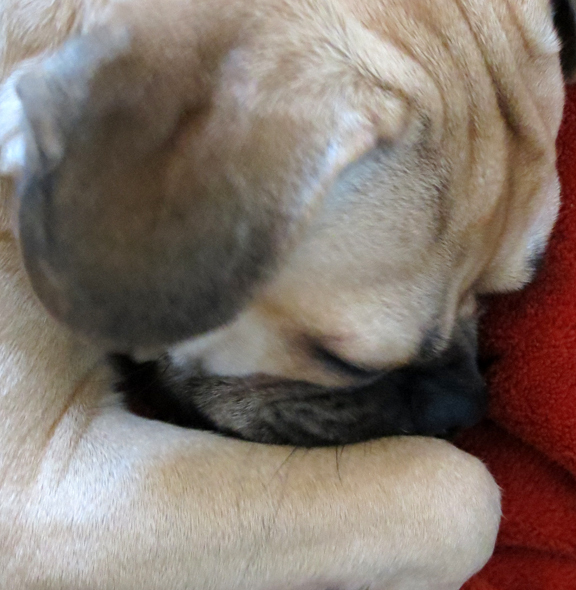 This, after having to chase her around the yard, our neighbor’s yards and down the wash one too many times! 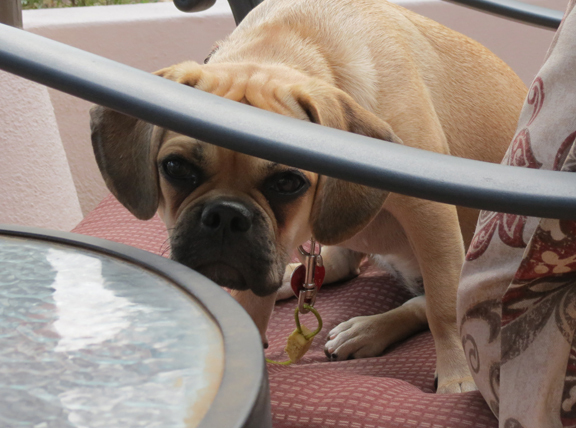 Todd’s backyard is not a great playground for a young puggle with no desert experience. The first time she tries to jump on a cholla will be her last!…And I don’t think Jairy the javelina would be very tolerant upon a chance meeting! But, Daizy still finds ways to stay entertained! Just the challenge of untangling herself, keeps her busy…’follow the yellow steel rope, follow the yellow steel rope, fa la la la la la la la, follow the yellow steel rope!‘ Then it’s off to see what else she can find to do in her little patio kingdom! 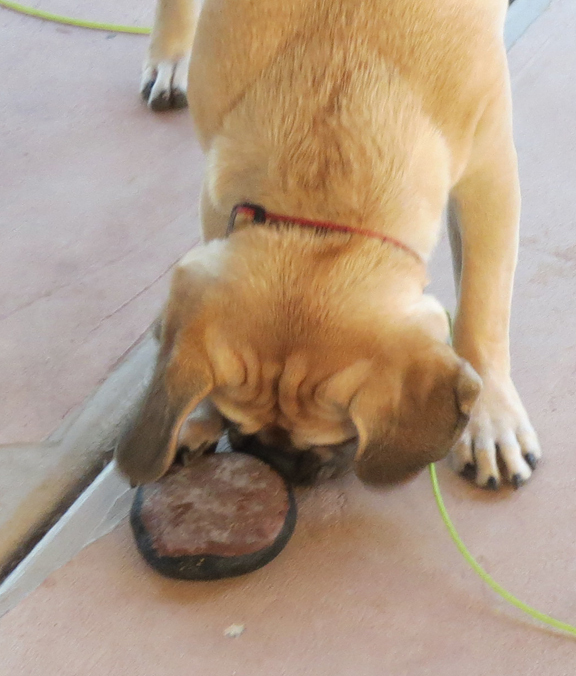 And has found a nice smooth rock she likes to push around with her nose…we call it rocky hockey! 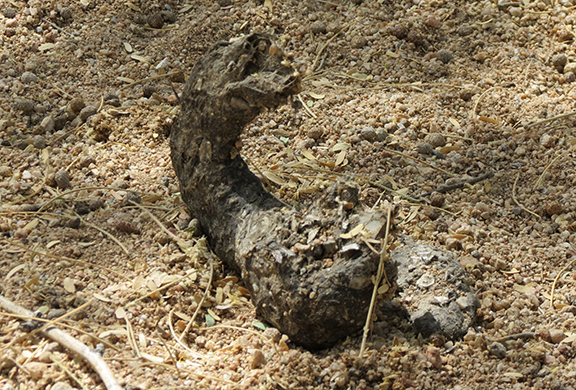 Even though it wasn’t rattling, it was obviously a rattle snake. You can tell by the shape of his head. Todd discovered him sitting under the bird feeder, right off of our porch. Needless to say, not a good place for this guy to be hanging out! 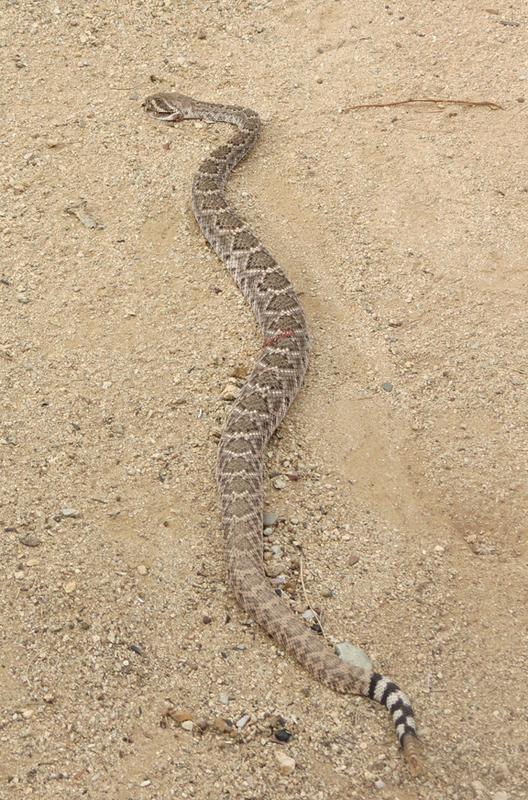 We love snakes and appreciate the job they do in keeping down the pack rat, mice and dirt monkey population. But a 4 foot killer snake sitting just off of your porch is not appreciated….so Todd eliminated the threat with a shot to the head. 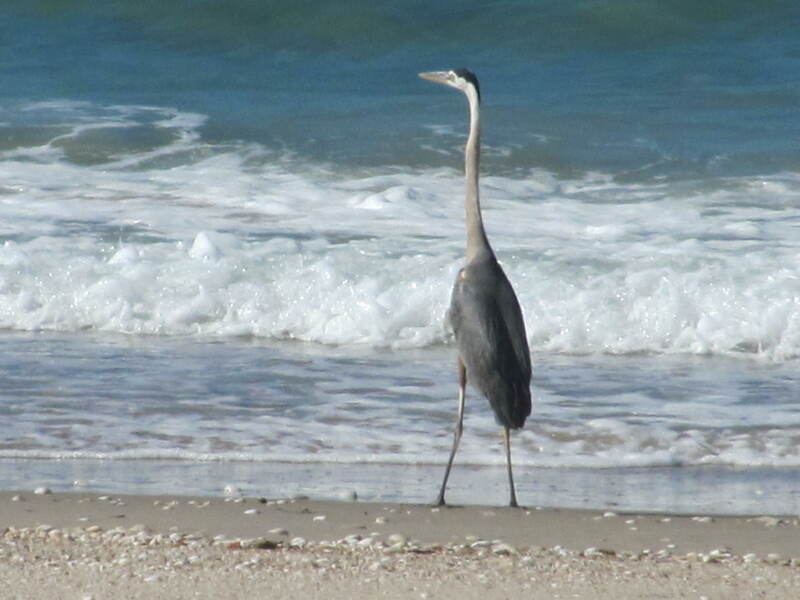 Sad, but better him than us, or our pets! 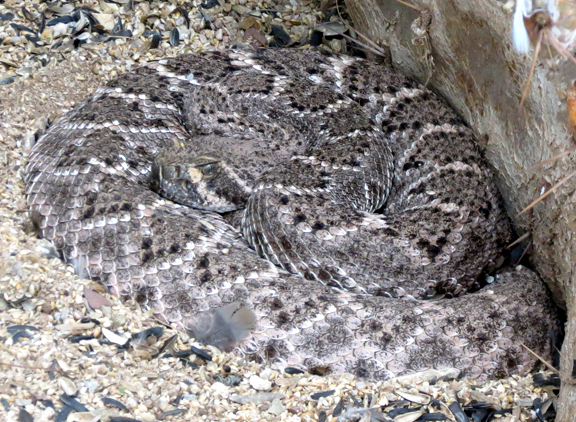 As long as the rattle snakes keep their distance, they can live a long happy life in Todd’s Backyard! 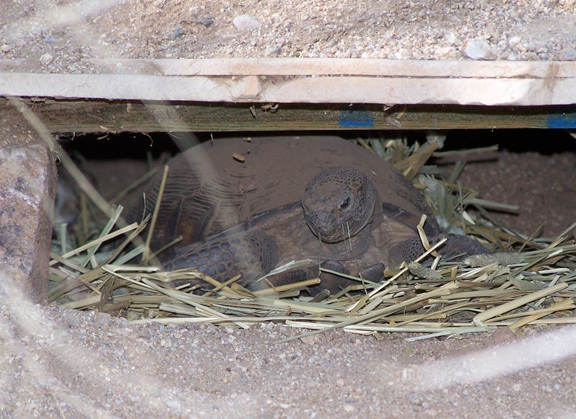 We always get a little nervous in the Spring, because you never know, after 6 long months, if Gerti, our desert tortoise, survived the Winter. 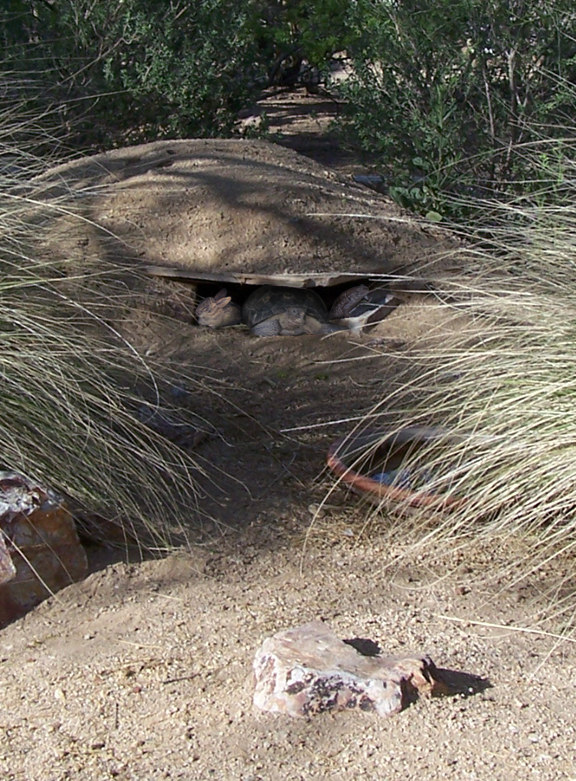 She heads into her den around mid November and sleeps until the heat starts kicking in mid May. This year we were especially nervous because it’s hit 100 degrees and we still hadn’t seen her. That, and she has collected a variety of roommates that are sharing her den! So we didn’t know if they’ve moved in because she had ‘checked out’! 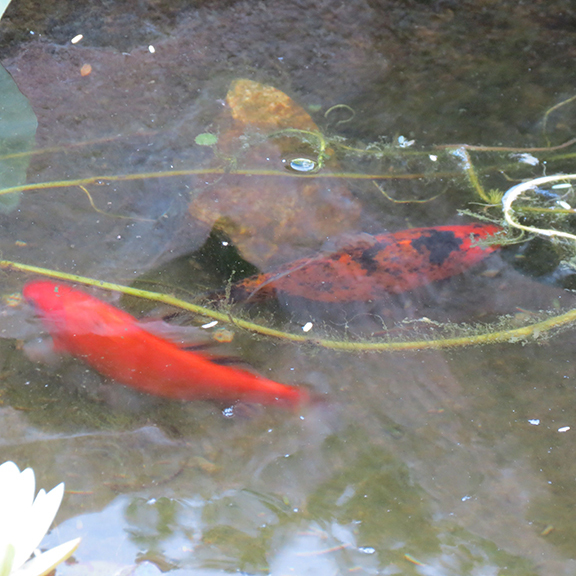 Finally, this past week, Gerti did emerge! Gerti emerges from her winter digs in need of a bath! And it seems that her being awake does not bother her live-in friends! 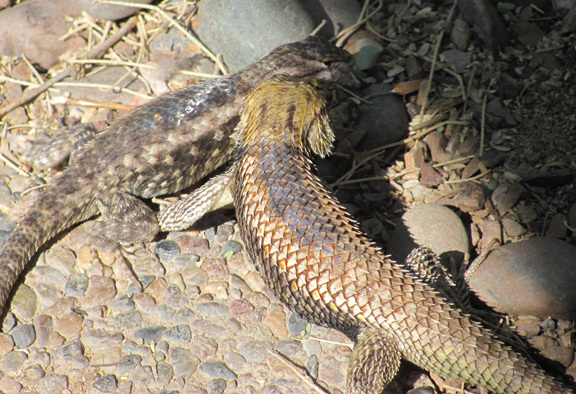 A pair of large collared lizards have made their home in Gerti’s den and have been busy populating the tortoise garden with baby lizards. Apparently, so have some rabbits! I don’t know how Gerti feels about this, but her roommates seem to be very comfortable sharing a space with a large, shelled reptile. 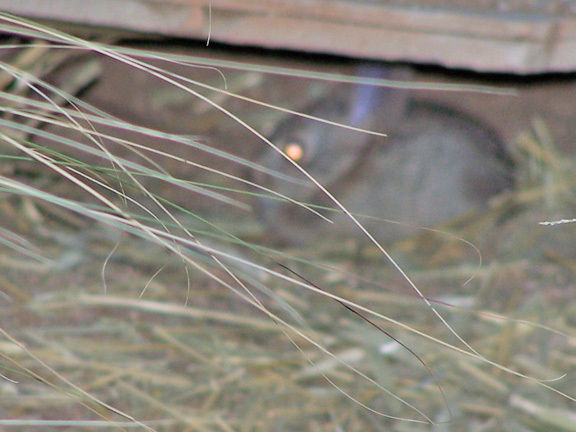 There have been 2 baby rabbits born somewhere in the tortoise garden, maybe even inside Gerti’s house, but whether they were born in or out of the den, they hang out in there! It’s funny seeing a tiny ball of fluff sitting inside Gerti’s house! The first one grew and moved out several weeks ago, and now there is another one! I would imagine that mama bunny knows that she’s found a pretty safe spot to spit out her babies, so it will probably become a pretty common occurrence. Unfortunately, not a great photo, but you can see his little eyes aglowin’! So, it could be a Summer long party at Gerti’s house!